Polytite Door Systems are made with triple-walled polycarbonate panels that are strong yet lightweight, providing easy operation with minimum stress on hardware components. The translucent panels provide a naturally-lit, inviting work environment and help reduce winter heating costs through the effects of solar heat gain. The panels are also extremely impact-resistant and can withstand long-term exposure to extreme elements such as sun, wind, rain and snow without cracking or splitting. 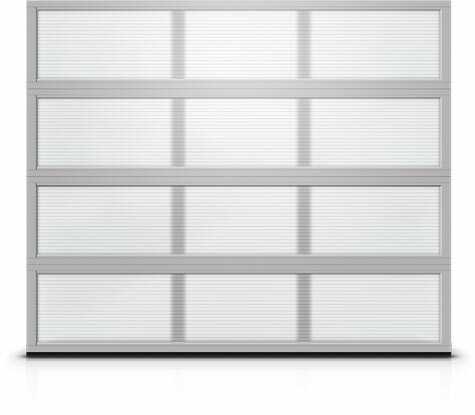 Particularly suited for service garages but ideal for all types of industrial, agricultural, commercial, institutional and residential overhead door installations where an attractive, light-transmitting, strong, lightweight door is desired. The external side of the Polycarbonate is protected with a coextruded layer warranting resistance to atmospheric agents and U.V. rays. Fire Reaction: ASTM E84-01 Flame spread and smoke. Developed: Class A. Fabricated from 6063-T6 aluminum alloy extrusions, extrusion thickness 0.063″ (1.6mm) thick, and 0.090″ (2.18mm) thick at hardware mounting locations. Insulated sections fabricated from pre-painted, hot dipped galvanized, steel sheet; with rigid polyurethane insulation core, CFC and HCFC free, face sheet stucco embossed and rib reinforced.